Ted is from Armagh, where he was a cathedral choir member. 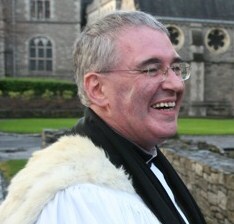 He trained in Dublin, where he also studied in the Irish School of Ecumenics. He is married to Hilary, from Merseyside. They met as undergraduates in the SCM in Durham. Both are members of the Third Order of the Society of St Francis. (Its aims are ‘to make our Lord known and loved everywhere; to spread the spirit of love and harmony; and to live simply.’) Hilary is a diocesan reader in Dublin, a committee member of the Dublin Diocesan Committee of the Church’s Ministry of Healing, and was a Mothers’ Union diocesan vice-president in Tuam. They have two sons – John (rector of Abbeystrewry – Skibbereen, Co. Cork) and Paul (aged 29). This entry was posted in Appointments, Cathedral, Clergy. Bookmark the permalink.